Comes with large outer slipcase, housing DVD and 12 film stills. Wrongly stated as being region 3 on box. Running time on box includes extras. Siu Wai (Cecilia Cheung), a stubborn girl from a broken family, and Ah Man (Louis Koo), the driver of a mini-bus she took every day, were engaged to be married. 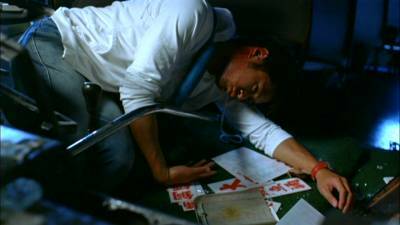 However, Ah Man was killed in a traffic accident, leaving behind Lok Lok, the son of Ah Man and his ex-wife. Despite opposition from her family, Siu Wai was determined to raise Lok Lok, to have Ah Man's mini-bus repaired and even to become a mini-bus driver herself. Dai Fai (Lau Ching Wan) witnessed Ah Man's accident and took pity on her. Seeing her lack of experience he helper her out on difficult occassions and taught her tricks to survive the intense competition, and the more they spent time together, the more reliant on him she became. The number of films that I've bought over the past three years and have just sat stagnant on my shelf, doing nothing more than gathering dust, is unbelievable. The amount of money that I've spent on films that I have not even got close to watching yet, I could have saved myself a fortune (by a student's standards). I've got over 200 unwatched films just now, and various TV show series. Admittedly a lot of these films were just impulse buys cause the cover looked good or something like that, but some films were bought because I'd heard so much praise lavished upon them. Lost In Time is one of those films, but because I knew it was a romantic drama, not my usual choice of genre, I've just let it sit on my shelf. All I can guess is that I've been in a strange mood recently, as I decided that it was the film I wanted to watch and, to quote a particular phrase, "Oh My God!"... The film blew me away! I now feel like such an idiot for leaving it this long to watch. 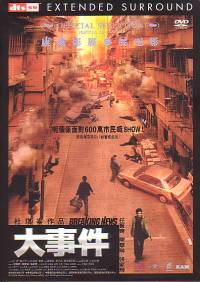 The film tells the story of Holly (Cecilia Cheung), a woman who is engaged to marry Man (Louis Koo) who is a minibus driver. A freak bus accident wrecks these plans as it leaves Man dead, and Holly on her own to cope with Man's son from a previous relationship. Believing she can cope and bring him up on her own, she tries to go about continuing Man's profession as a mini-bus driver, but quickly learns that neither are as easy as she had thought. With the help of Hale (Lau Ching Man), a colleague of Man, she very slowly starts to find her feet and cope with her life, although the path there is as rocky as it possibly could be. Right, I'm crap at writing synopsises that don't give too much away. Believe me, the film is way better than what I've written above makes it sound! I freely admit that my preferred genres of film are generally either comedy, martial arts, action, violence, thriller or suspense/horror. You'll notice that neither romance nor drama appear in that list, and Lost In Time is a romantic drama. Despite this I was completely engaged in the film from start to finish, I cared about the characters, I was concerned with the way events unfolded and in one scene I was honestly close to tears. The latter comment is what I find the hardest to believe, and that is a testimony to how good Lost In Time is in all aspects. The story, while being relatively simple, is handled expertly, the script is excellent as it disperses with all clich�d elements and comes across far more real to life, making it far more natural and believable. There is virtually nothing to fault at all with the film and for god's sake, I almost blubbered. It was probably my few remaining strands of macho manliness that kept the tears back. For me, the key factor that makes this film work where other romantic drama have failed is that Lost In Time keeps its feet firmly planted on the ground. There is nothing in the plot or script that seems staged simply to move the relationships along, nothing that occurs is far fetched, everything actually seems natural. The characters' predicaments certainly are not enviable, perhaps something that makes the viewer feel more for the characters involved but it is definitely not the only thing. Her opposite number is Lau Ching Wan, definitely a far more experienced actor than Cecilia, but here he is the secondary attraction. I don't want to take anything away from his performance at all, as it was also first rate, but on a comparative level as Hale he didn't seem quite as real as Holly. 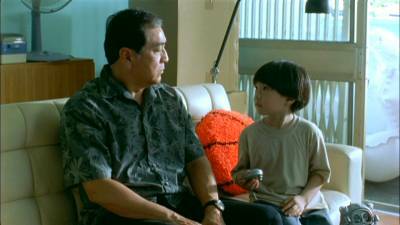 The exceptions to this are in his scenes with Man's son, Laurie (Daichi Harashima). The chemistry between the two as they play is quite unbelievable, and it is hard to believe that it was all acting. Had the cameras been off anyone watching could easily have thought it was just a loving father playing with his son. The film is not without its flaws though, although they are very minor on the scale of things. Firstly, and this is just something I would have liked, there is no sense of time-scale over the course of the film. As things develop between Holly and Hale I had no idea how long had passed since the death of her fianc�, Man. For all the indication we are given it could easily have been only a month, yet it could also quite as easily have been nearer a year, and all the viewer saw was snippets of that time. The only indication that we are given is when we learn that Holly has missed two school tuition payments for Laurie, but I don't know how often those payments were to be made - monthly, quarterly? My only other gripe would be that the ending takes us far closer to the realm of movie endings than I would have liked. The rest of the film was made to look so real to life, that the ending gives the reminder that it is still a film - a form of entertainment out to make money. Granted there were still no terrible clich�s or anything like that, but an ending more in the tone of the rest of the film would have been better. Probably because romantic dramas are not the sort of films that I watch often, Lost In Time has very little rewatch value for me. However, I do have to state that the film is still an absolute must see film, and very possibly one of the finest examples of this genre available. With the choice of either a stereo, Dolby Digital 5.1 or DTS Cantonese track, I chose the DTS option. For films like this I don't see how a DTS track could really offer anything more than a DD5.1 track, as it is not a sound effects heavy film. Anyway, everything that I could hear sounded really crisp and clear. In some of the instrumental score you could hear the twanging of individual strings on some instruments, making the instruments very defined. The surrounds are put to good use where needed, with discrete effects like talking or cars coming from the rears in places. However, I did notice that for a few minutes or so (or at least that is all I noticed) midway through the film, the speech in the DTS track appeared to be slightly out of synch with the lip movements. I don't really know how long it lasted for cause I think I stopped noticing, as I was so engrossed in the film, but it does occur. The subtitles are not perfect, but are nonetheless very good. There are a few spelling errors here and there, and likewise with the grammar. Some lines of subtitles are not on screen for long enough, which resulted in me having to rewind the film at times. Also the vast majority of the writing on screen is not subtitled, and in some cases it would be highly advantageous to have had it subbed. Only one word of writing is subtitled, which is very strange, as if it was decided to subtitle that word, why not the rest of the writing throughout the film? On the whole the anamorphic widescreen transfer is very good. There are only a few speckles here and there, colours are well saturated and bold, detail levels are generally high with only a small amount of noticeable grain effects, black levels appeared to be good and shadow depth was equally as detailed. There was an obvious, but very slight, defect with the film print used to create this transfer as about 15 minutes into the film a very faint vertical line traverses the screen from left to right. Other than that, there is much to complain about. The DVD comes in a special box that contains the actual DVD case and also 12 film still cards. Each of these is on nice thicker glossy paper, and the back of them has Chinese writing. The slipcase is the same height and depth as a standard slipcase, but is approx. 2.5 times wider. Not one that will fit easily onto most DVD shelves! The main extra on the disc is a 20 minute Making Of. This is in Chinese only with no English subtitles, so I just skimmed through it. It contains interviews with various cast members, film clips and shots of scenes being filmed. The only other extra are Previews for Hidden Track, Spy Dad, Naked Ambition and this film, Lost In Time. If you are the type of person that likes a good blubber during a film, as you want to be emotionally affected, then please check out Lost In Time. Since I got that close, I have no doubt others will do so as well. There is virtually nothing but the highest of quality here - from the story to the script to the acting, it is amazing. Buy it!